Fig. 1. Preparing new study orchard. 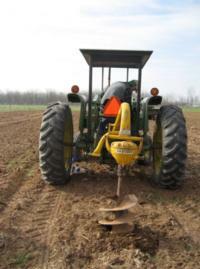 This component of the project involves developing an understanding of the timing of root activity, and characterizing nitrogen and water movement through the soil profile. In addition, the absorption of nitrogen and water by roots is under study. 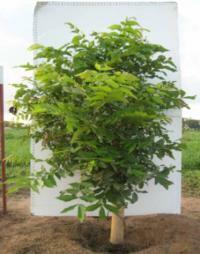 Nitrogen application is an essential horticultural practice for optimal tree growth and profitable pecan production. To ensure productivity and crop quality, N is applied in the largest amounts.There is little information that validates the current recommendations with root development and whole-plant physiology. We believe that new strategies are necessary to improve the efficiency of nitrogen application. However, lack of below ground data hampers our understanding of the processes governing the cycling and utilization of N. Knowing when the roots are active, and when applied nitrogen is absorbed by roots is crucial to develop improved management practice. Fig. 2. Canopy of a young Pecan tree in the study. Texas A&M University. 2010. Regarding irrigation practice, Most small- to mid-size pecan growers still base their irrigation schedule on intuition or calendar days. Goals of this study include targeting applications of water and nitrogen to the periods of maximal root activity and plant needs, minimizing the detrimental effects caused by nitrogen application and water misuse, and sustaining and efficiently using land resources in production through improved management systems.